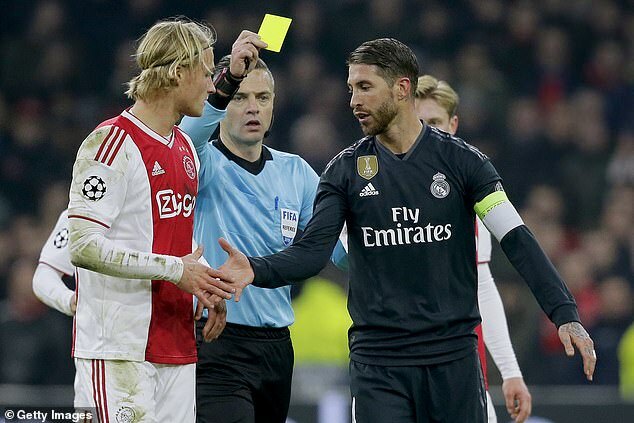 Sergio Ramos has risked being banned for an extra game after incredibly appearing to admit that he got himself booked on purpose during the closing stages of Real Madrid‘s victory over Ajax on Wednesday night. The Madrid captain recklessly took out Danish forward Kasper Dolberg as the Dutch side attempted to break, getting absolutely nowhere near the ball. He seemed furious with Dolberg but his anger completely dissipated the moment the card was brandished. The yellow was Ramos’ third in this season’s Champions League, meaning he will now serve a one-game suspension in the second leg of of the last-16 tie and be free to play in the quarter-final, which will likely be a tougher test. 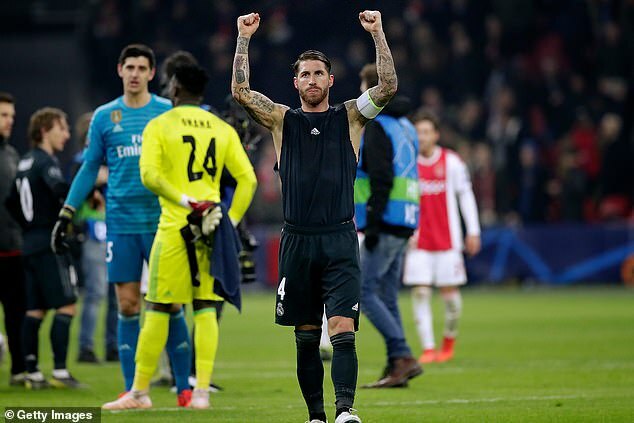 Viewers watching believed that that was exactly the result that Ramos was looking for with Madrid now clear favourites to advance after a big away result and the Los Blancos skipper has now confirmed their suspicions. 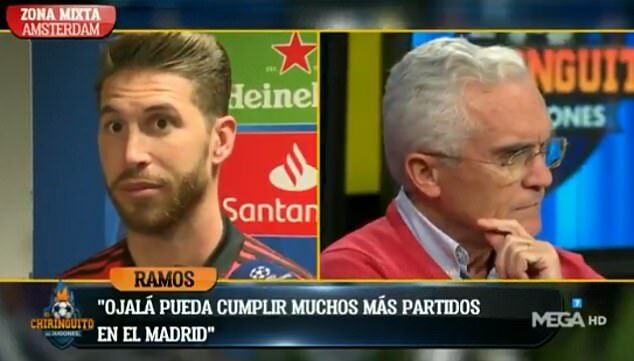 ‘Not to underestimate the opponent, but sometimes you have to take these decisions and that’s what I decided,’ he said in a post-match interview with El Chiringuito TV. BT Sport’s commentators immediately noticed something was up with one quickly asking if that was ‘the booking he was looking for’ following the blatant foul. Players face suspension for two competition matches or a specified period for clearly receiving a yellow or red card on purpose. UEFA rules stipulate that players will receive a ‘suspension for two competition matches or for a specified period for clearly receiving a yellow or red card on purpose’. Madrid team-mate Dani Carvajal received such a ban following his booking in the final minute of the 6-0 win over Apoel Nicosia in last season’s tournament. Ramos has been accused of deliberately seeking bookings in the past, notably when he and Xabi Alonso, both on the verge of suspension, were booked in the final minutes of a Champions League first leg against Galatasaray in 2013. The same duo also faced similar accusations in a group game at Ajax in 2010, with Madrid 4-0 up and guaranteed a last-16 spot. They dallied over set-pieces, each earning a second yellow for time-wasting, suspension for the irrelevant final group game, and a clean slate for the knockout phase.